Now Gandhi heard about an obnoxious system of agricultural labour prevailing in Bihar. In the Champaran district of Bihar, the cultivators were forced by Europeans to grow indigo, a blue dye, and this imposed on them untold sufferings. They could not grow the food they needed, nor did they receive adequate payment for the indigo. Gandhi was unaware of this until an agriculturist from Bihar, Rajkumar Shukla, met him and told him of the woes of the people of Champaran. 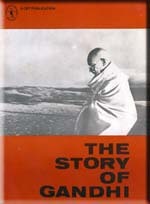 He requested Gandhi to go to the place and see for himself the state of affairs there. Gandhi was them attending the Congress meeting at Lucknow and he did not have time to go there. Rajkumar Shukla followed him about, begging him to come and help the suffering villagers in Champaran. Gandhi at last promised to visit the place after he had visited Calcutta. When Gandhi was in Calcutta, Rajkumar was there too, to take him to Bihar. Gandhi went to Champaran with Rajkumar early in 1917. On his arrival the District Magistrate served him with a notice saying g that he was not to remain in the district of Champaran but must leave the place by the first available train. Gandhi disobeyed this order. He was summoned to appear before the court. He visited many villages. He cross-examined about 8,000 cultivators and recorded their statements. In this way he arrived at an exact understanding of their grievance and the causes underlying them. He came to the conclusion that the ignorance of the cultivators was one of the main reasons why it was possible for the European planters to repress them. Gandhi therefore set up voluntary organizations to improve the economic and educational conditions of the people. They opened schools and also taught the people how to improve sanitation. The government realized Gandhi’s strength and his devotion to causes. They themselves then set upon a committee to enquire into the grievances of the cultivators. They invited Gandhi to serve on that committee, and he agreed. The result was that within a few months the Champaran Agrarian Bill was passed. It gave great relief to the cultivators and land tenants. Gandhi could not stay longer in Bihar. There were calls from other places. Labour unrest was brewing in Ahmedabad and Gandhi was requested to help settle the dispute.